After the clarification by the FIA that the overtake pass of Red Bull driver Sebastian Vettel crossing Vergne was legal, Red Bull has expressed its satisfaction on the matter. Vettel was at 6th place in the race and was declared world champion for third consecutive year, making his youngest ever triple champion. Red Bull was declared the winner team of the year. Ferrari which was second in the team position of the year had complained FIA regarding the issue. However, FIA declared yesterday that there was no issue with the pass and was declared legitimate according to the rules applicable at the Brazilian GP. 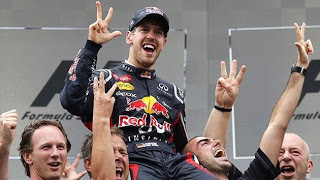 In response to the FIA statement, Red Bull has welcomed the decision at their website and celebrated their win as the champion team of the year with their German driver Sebastian Vettel declared champion for third consecutive year.